Social media is both a blessing and a curse. It's great for keeping in touch with family and friends or building networks, but there's simply too much of it. If you sign up for Facebook, Twitter, Instagram, Youtube, Vimeo, etc. etc. etc. and also write your own blog then it becomes a full-time job just to keep up to date with the avalanche of e-mails updating on status. So, in the interests of efficiency and, dare I say it, an easy life, I'm streamlining my virtual self . . . starting with my blogs. Up to now I've had three blogs. Why? . . . I haven't got a clue, so all the more reason to combine them together. So, here you will find the contents of The Cycling Diaries and Laughing in the Sun, as well as the usual Velo-Shed tat. 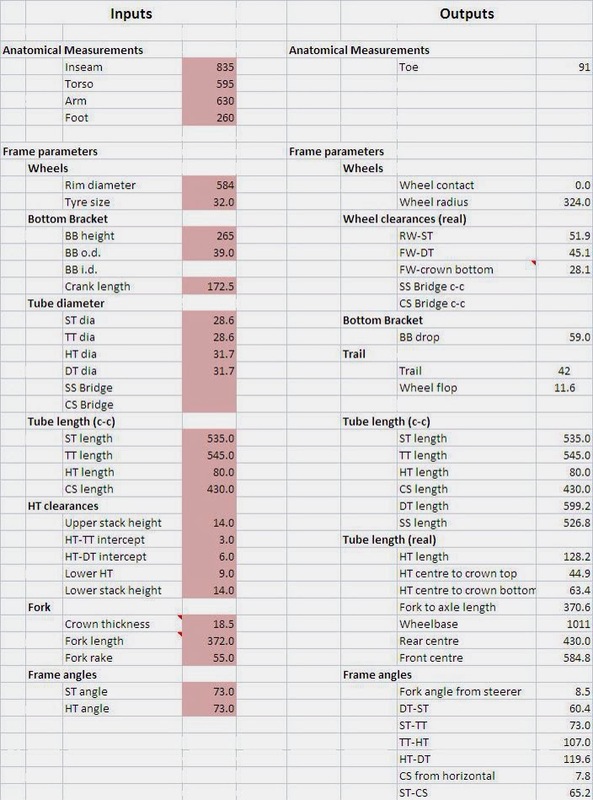 Designing a frame requires maths . . . not much though, that's the good news; it's GCSE maths. 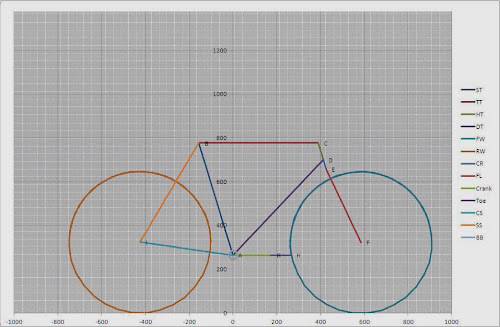 You can buy expensive software such as BikeCad to do this for you; this is very good, with a free, on-line version . . . but what do you learn about the design process when you use a black box? So I thought why not design from scratch so I understand how it the parts fit together and interact; and from that understanding I should be able to build a better bike. I didn't come by this idea through divine inspiration. 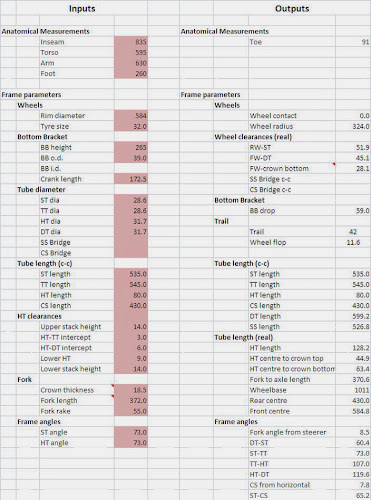 There is a spreadsheet application out there called BG101 which is a highly functional Excel spreadsheet that calculates the tube angles, lengths clearances, plots the final frame design, templates for the tube mitres etc. etc. . . . it's pretty good. But, as with every spreadsheet I've ever come across which is written by someone else; and that is exaclty the problem . . . it's written for someone else. But then I thought 'this is actually really simple to do for anyone who knows about spreadsheets with simple maths and the ability to plot a graph', so I set about writing my own. I plotted the front triangle as a series of right-angle triangles using the trigonometry rules of tan, sine and cosine of the ST and HT angles, or their complements, and the c-c lengths of the ST, TT and HT. For example the ST had co-ordinates of [0, 265] and [0 - ST x cos(ST angle), 265 + ST x sin(ST angle)]. Once these co-ordinates were calculated the DT co-ordinates were automatically fixed, so the HT-DT angle and DT length were computed. I applied the same logic to calculate co-ordinates for the CS, SS, crank, toe overlap, fork etc. using the appropriate lengths, angles and chosen values for, rake and trail. Then I used these co-ordinates to plot a graph with lines representing the c-c tubes lengths in Excel as shown below. Small lugged frames are tricky because there just isn't enough HT to fit the lugs on. These design limitations can be reduced by using smaller wheels such as 650b. This is because you can extend the HT and reduce the fork length, but only if you don't use huge tyres otherwise the wheel radius ends up as big as 700c. Lugs and BB shell only come in a limited selection of angles. You can play arounf with the HT and CS length to solve this but then compromise elsewhere is necessary, or you may have to file them to get the angles you want, but only by so much. Now I know why people life to fllet braze . . . Commercially available forks come in a limited range of sizes, especially so for steel. Make your own!